Upon taking a virtual peek inside our most frequented shop, St. Rita’s Bakery, I’m immediately hit with a wave of nostalgia. Not much has changed over the years; I can spot the slices of pan pizza out on the back counter, a pile of angel wings awaits a final dusting with powdered sugar, and there, on the top shelf of the rightmost pastry case you can spot these cookies, surrounded by two of my other favorites. If you ever wondered where my love of almond-focused baked goods came from, well, it’s that trifecta of cookies right there. If you’ve never had the pleasure of nibbling on one of these chocolate-enrobed confections, here’s what you’re getting into: three layers of somewhat spongy-yet-chewy almond cookie, two thin layers of apricot jam and two snappy layers of chocolate. Quick math check. Yep, seven layers. The cookie itself reminds me in part of a nut-enriched chiffon, both in texture and technique, so if they remind you of petit fours in appearance, that’s not too far off in actuality. The trickiest part to master in all this? Cutting the cookies. It’s definitely one of those things that takes a few goes to master — knowing just how much pressure to exert on the easily shattered chocolate coating in order to get a clean line, which knife (or knives) in your arsenal are best-suited for the task, etc. The good thing, it’s delicious, delicious practice and even the less-than-picture-perfect cookies taste fantastic! Preheat oven to 350°F. Line a single (or 2 or 3, if you have multiples!) 9″x13″ metal baking pan with parchment paper, leaving overhang on both of the long sides. Butter exposed pan edges and parchment paper; set aside pan(s). In the bowl of a stand mixer fitted with the paddle attachment, combine the butter, almond paste and 3/4 cup of the sugar. Beat on medium-high speed for about 3 minutes or until light and fluffy. Scrape down the bowl, add the egg yolks and almond extract, and continue to beat until well-combined, about 2 minutes, scraping down bowl as needed. In a small bowl, whisk together dry ingredients (millet flour through salt). Add dry ingredients to the almond paste mixture and mix on low speed just until combined; set aside. In a clean stand mixer bowl with whisk attachment (or mixing bowl with hand beaters or by hand with a balloon whisk) beat egg whites to soft peaks. Gradually sprinkle in remaining 1/4 cup sugar while whipping egg whites to stiff, shiny peaks. Gently stir about 1/3 of the egg whites into the almond paste batter to lighten, fold in remaining egg whites. Divide batter evenly between three clean bowls (about 12 ounces/340 grams of batter in each). Using a clean spatula for each, fold 15 drops green color into one bowl, 15 drops red into the next and 5 drops yellow into the last. Transfer each color batter to its own pan (if you’re using just one pan, bake one and set remaining bowls aside for later), use a small, offset spatula to spread into an even layer. Transfer pan(s) to oven and bake for 8 – 10 minutes or just until they start turning light brown and pull every-so-slightly away from the edges. (In my oven, I can bake up to two 9″x13″s on one rack at a time.) Using parchment paper overhang, transfer layer(s) to racks to cool. If you need to reuse the pan, be sure to cool pan completely between batches! Cool all layers to room temperature before proceeding. Transfer one cooled cake layer (red or green), parchment side up, to a small, clean baking sheet or cutting board (basically something small enough to fit in your fridge or freezer, but larger than 9″x13″) covered with plastic wrap. Peel away parchment, spread half of the strained and cooled apricot preserves over top and carefully place yellow layer on top (if the layer cracks, don’t worry, piece it together into a single layer as best as possible and proceed). Remove parchment and spread with remaining apricot. Remove parchment paper from the final layer, and set on top (make sure the former parchment paper side is down, touching the apricot). 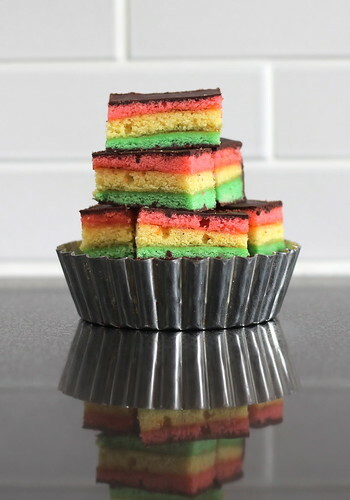 Place a sheet of plastic wrap over cookie brick, top with another similarly sized baking sheet or cutting board (nothing too heavy) to weight slightly, and give a couple light presses to make sure layers stick together well. Transfer to fridge (4 hours) or freezer (1 – 2 hours) to chill completely before proceeding. About 15 minutes before you’re ready to coat cookies with chocolate, remove them from the fridge or freezer, set top weight aside and peel and discard top layer of plastic wrap. Just before coating, place half of the chocolate in a small, heatproof bowl (preferably metal, I use a 2-quart stainless steel one by Endurance/RSVP) or in the top of a double boiler. In a small saucepan (I use this 2-quart pan) over medium heat, warm about 1” of water (make sure there’s at least 1/2” of space between the water and bottom of the bowl when it’s placed over the top) until it just barely reaches a simmer. Reduce heat to low and set bowl with chocolate over top. Stir/fold chocolate and heat just until about 75% of the chocolate is melted. Remove bowl from heat and slowly stir until smooth. Pour melted chocolate over top layer and work quickly to spread it in an even layer (the offset spatula comes in handy again). Allow chocolate to set before placing a clean sheet of plastic wrap over top and flipping cookie over with the use of the baking sheet/cutting board that was set aside. Melt other half of chocolate and pour/spread over top as before. Allow to set at room temperature before transferring to the fridge to cool completely. Once chocolate has set completely, you can cut them into bars. Trim edges (set them aside for snacking) to get a clean, rectangular shape. You can make any size cookie bars you like, but I generally go with 4 equal size strips lengthwise (so about 2″ wide and 12″ long) then cut each strip into 16 pieces (each about 3/4″ long). Serve chilled or at room temperature. To store: wrap cookies tightly with plastic wrap, transfer to a storage or freezer bag (whichever is appropriate for your storage method). They’ll keep for about a week in the fridge or 3 months in the freezer.